In the first few months of the season, the thing I love most about the farmers market is that with each week, the list of available produce grows longer. Every Saturday morning holds new surprises as well as old favorites I’ve waited for since last season. One of these old favorites is the garlic scape. A tender green shoot sent up from the root of hardneck garlic, a scape stalk looks like a curling, twisting green onion. (It's similar to but not the same as green garlic, which is just immature garlic shoots.) The taste isn't as strong as that of mature garlic; I call it "garlic lite." If left unattended, a garlic scape will form a small flower or bulb and eventually harden, turning as papery and gray as the harvested bulb. Gardeners usually snip the scape in order to focus more of the plant’s energy on the growing bulb. While some gardeners simply toss them in the compost bin, others have discovered just how delicious scapes can be. They usually make an appearance in the first week of June, and last a very short time. When scouring the market for a perfect bunch of scapes, look for those that have hardly curled. (If cutting from your own garlic patch, try to snip before or just after that first curl. Never pull; always cut.) The longer and curlier the scapes become, the hotter and more intense their garlic flavor. Aim for a scape that is no longer than eight inches. More mature scapes should be snipped at the bottom after picking, much like the tough end of asparagus. 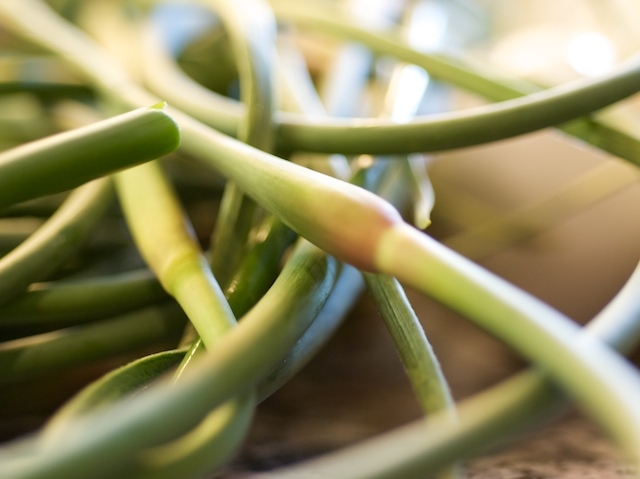 Young and tender scapes need almost no additional trimming. If present, the flowering bulb should be snipped as well, as it is much too delicate for cooking. Preparing garlic scapes is a cinch. Their subtle flavor can be easily enhanced with a quick sauté or a brief moment on the grill, accompanied by a drizzle of olive oil and a dash of salt. They also pair well with browned butter and a squeeze of lemon. The younger the scape is, the lighter the flavor. The youngest, most tender of the shoots can be quickly chopped and mixed raw into salad dressing, potato salad, or salsa. Substitute scapes for basil in your favorite pesto recipe, or mix into a fresh aïoli. Larger, more mature scapes can be tossed into pasta, puréed and mixed with lemon and pepper for compound butter, or sliced and sautéed in a stir-fry. With their sweet garlic flavor and short season, garlic scapes are sure to leave you wanting more. Consider freezing some scape purée, or even pickling scapes to tide you over until next year. For the truly converted, prime garlic planting season isn’t until just before the first freeze. So you’ve got plenty of time to pick your favorite hardneck variety for your climate, then plant and cultivate your own patch for next June.